The current climate change we experience calls for understanding how our environment responded to natural variations of climate in the past. It is well established that the global climate had shifted from glacial conditions when ice accumulated in the poles and highlands to interglacial conditions when this ice had melted. The melting of ice causes, in turn, large variations of the global sea level, yet, there are other variations that have significant consequences that are also in play. For example, changing the “regular” wind direction or rain patterns can cause extensive floods that current infrastructure cannot contain, or, on the other hand, prolonged periods of drought. To study the possible outcome of these variations we investigate the “natural” deposits that accumulated at a time when humans had significantly less effect on the earth system. Moreover, we do so in specific regions; for example, in the Middle East, the Dead Sea continuously accumulates sediments and their character is changing according to the environmental conditions. When the region is arid, then the lake precipitates more salt, and when the region is humid (more rain), floods flush soil into the lake and mud layers are deposited. A more detailed investigation can be done regarding the sources of soils deposited on the floor of the Dead Sea, which would reveal the rain patterns indicating whether more precipitation occurred in the northern parts of the Dead Sea watershed or its southern parts. To study how the known climate changes of the past influenced the climate in the Levant, we need to look at the Dead Sea bottom, where salts and soils accumulated in the past. This is done by extracting a tube full of the Dead Sea sediments in their layered order of deposition. 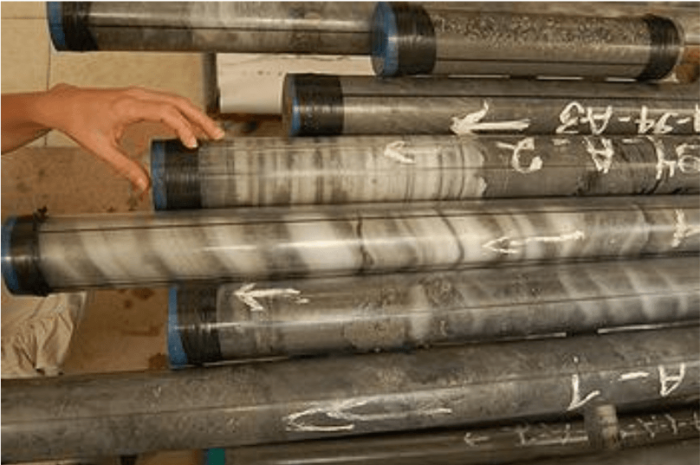 These layers are extracted using specialized drilling equipment that retracts tubes filled with the sediments, which call these “cores” (Figure 1). Thus, the study of these cores opens a window to understand the past changes that had occurred during previous climate change. Figure 1- Cores from the Dead Sea floor showing major climate shifts that took place in the past. Salt indicates arid interval and mud indicates humid interval. Image courtesy Daniel Palchan. Yet, the study of the ancient climate is rooted in the modern conditions as articulated by the 18th-century Scottish geologist Charles Lyle: “The present is the key to the past.” Thus, we begin with investigating the contemporary configuration of soils in the Dead Sea watershed. Soils around the Mediterranean are strongly affected by dust that originates in the Sahara Desert. In Israel, it has been suggested based on mineralogy that over 80% of the soils are comprised of Saharan dust. This was recently corroborated by the resemblance of the isotope signatures between these soils and of the source rocks located in the Sahara. The isotope composition, as well as other geochemical properties, act as a fingerprint to identify the source of the investigated material. Thus, dust is deposited in the Levant, mainly from the Sahara, and is undergoing pedogenetic processes that dissolve and re-mineralize constituents in the soils. These processes are climate sensitive and cause differentiation of the geochemical character between the different regions of the Dead Sea watershed, that extends from hyper-arid climate in the south (Saharan like) to temperate climate in the north (European-like). Figure 2- The Dead Sea watershed and the sample locations. Image courtesy Daniel Palchan. 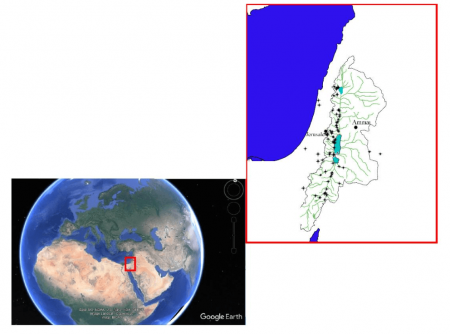 In this study, we have sampled dust storms from the Sahara and from Arabia, as well as soil cover throughout the Dead Sea watershed and chased flood events that carry mud to the Dead Sea. We used chemical and isotope compositions to characterize the different sources giving a unique fingerprint to the various regions. This information will serve future investigations on the Dead Sea core regarding the climate changes that were recorded in the sediments of the Dead Sea. These findings are described in the article entitled Geochemical characterization of contemporary fine detritus in the Dead Sea watershed, recently published in the journal Chemical Geology. I am a geochemist who studies earth's past climates. My Focus is using radiogenic isotopes on marine and lacustrine sediments to understand the effects of short term climate changes, especially during deglaciation periods. In the past I have used major and trace elements analysis along with isotope ratios of Nd and Sr. Lately I have implemented U disintegration series on marine sediments in the Red Sea to study the 232Th based mass accumulation rates.